Holiday Tweet Hearts [J1742] - $6.00 : Yarn Tree, Your wholesale source for cross stitch supplies. Cross stitch chart from Imaginating. Designed by Ursula Michael. Tweet, tweet, tweet! 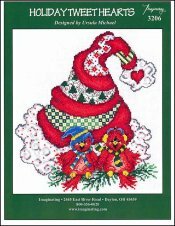 A large red Santa hat with decorative rows of Christmas trees, flowers & hues of green checkers, stands behind two adorable red birds. One bird has his blue Santa hat on & a scarf around his neck. The other bird has ear muffs on & a scarf around her neck. Keep warm little ones! Look at the pompom on Santa's hat, it has a red heart. This is "Holiday Tweet Hearts." Stitch count 120v x 136h. Stitched on #2936 Zweigart Aida 14ct White 59" wide or #8221 Zweigart Aida 14ct White 43" wide.